Jen has chosen the Queen! You all did not disappoint! I love all the different variations on my sketch for this week. What an amazing gallery. I fell in love with these gorgeous flowers and the pretty polka do background. Congrats, Vicki, you are our Queen of Clean! Please join us next week for a new sketch designed by Jen Mitchell! Thank you so much for choosing my card for the "Queen" this week, I am so honored!!! 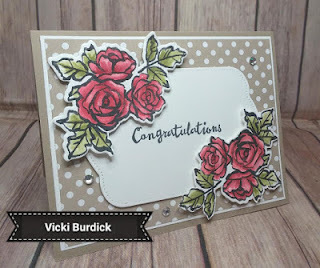 Congratulations and thanks to Jen B for choosing my card, it's great ! Congrats to Vicki and all the winners. Thank you Jen M for choosing my card. All beautiful cards! Thanks Narelle for choosing my card!